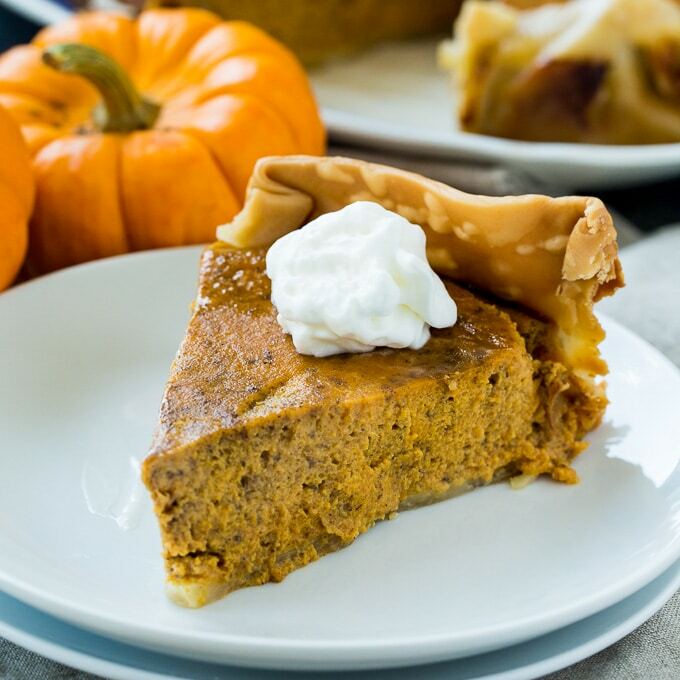 Crock Pot Pumpkin Pie is unbelievably easy to make. After a little over 3 hours in the crock pot on HIGH, the filling sets up and has plenty of pumpkin flavor along with cinnamon, cloves, ginger, and nutmeg. This recipe is perfect for the holidays. Not only is it easy to make, it frees up valuable oven space and you’ll have the wonderful scent of pumpkin pie filling your house all morning long. I use a 6-quart crock pot for this recipe and the filling is the perfect height. 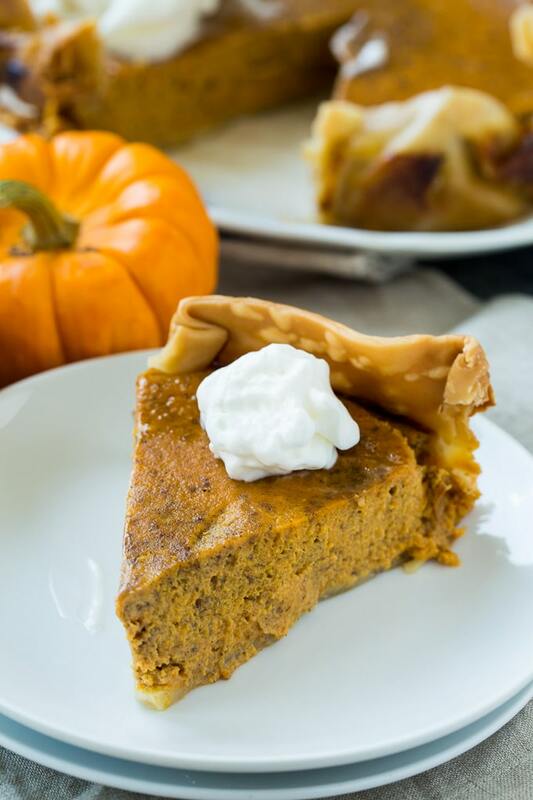 This Crock Pot Pumpkin Pie recipe uses a refrigerated pie crust to make it quick and easy to prep. You can have everything ready to go in the crock pot in under 10 minutes. 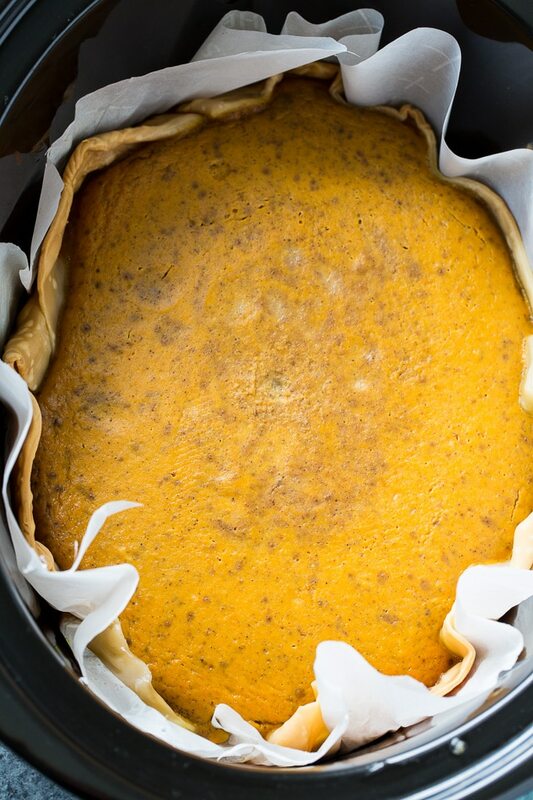 To make it easy to remove the pumpkin pie from the slow cooker, a layer of parchment paper is used. Let the pie cool a little while in the slow cooker insert. Remove the insert from the crock pot so it will cool faster. After about 30 minutes, you should be able to remove the whole thing by lifting up on the parchment paper. Slice it and serve with some whipped cream. You will love the custardy texture that’s full of fall spices! 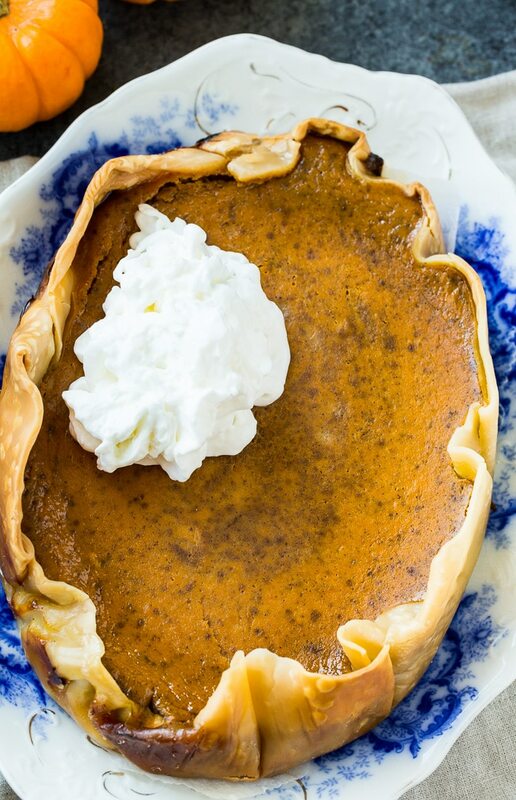 Crock Pot Pumpkin Pie is unbelievably easy to make. The filling sets up wonderfully and has plenty of pumpkin flavor along with cinnamon, cloves, ginger, and nutmeg. In a medium bowl, whisk together eggs, pumpkin, half-and-half, brown sugar, cinnamon, ginger, salt, cloves, and nutmeg. Set aside. Unroll pie crust on a piece of parchment paper. Use a rolling pin to roll it out a little longer in one direction (an inch or two) to make it more of an oval shape. Lift parchment paper and place in the bottom of a 6-quart crock pot. Note: You can use a round crock pot. No need to roll the pie dough out. Press and shape the pie dough to fit the bottom of the crock pot. Trim the parchment paper so it only extends a little beyond the dough. Cover and cook on HIGH for 3 hours and 15 minutes. Remove lid and remove crock pot insert from crock pot. Let cool 30 minutes and then remove whole pie from crock pot using the edges of the parchment paper to lift it out. Slice and serve with whipped cream. If not serving right away, refrigerate. This entry was posted in Pies and Tarts, Slow Cooker and tagged crockpot recipes, pumpkin. Bookmark the permalink. Crock pot for pumpkin pie? I would have never thought of that! I’m gonna have to try this! Do you have to bake pie shell first before adding to crock pot. No, you do not bake the pie shell first. I can’t wait to try this recipe! I didn’t know that I could make pie with crock pot! Thank you for sharing! !